Chelsea duo Eden Hazard and N’Golo Kante are among Real Madrid’s top transfer targets for the summer, according to latest reports. The Blues face a possible nightmare this summer as a number of their best players are linked with exits from Stamford Bridge after this difficult season. According to Don Balon, Kante wants out as well as Hazard, and Real Madrid hope to try signing both players by offering Chelsea a choice of four potential signings in return. 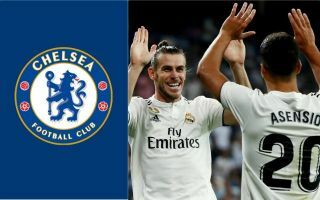 One of those is Mateo Kovacic, already on loan at Stamford Bridge, while Don Balon also claim CFC could be offered Marco Asensio, Gareth Bale or James Rodriguez, the latter of whom is currently on loan at Bayern Munich. It remains to be seen if Chelsea would be prepared to accept anything like that if it meant losing both Hazard and Kante in one go, with that being potentially fatal for the club in their bid to rebuild next term. N’Golo Kante to leave Chelsea for Real Madrid? While Kovacic has done reasonably well on loan in west London, he’s far from world class, while Asensio, Bale and Rodriguez have also all generally under-performed for some time now.